When West Virginia Secretary of State Mac Warner took office in 2017, he instructed his staff to explore ways to make voting more convenient for military personnel, their families and civilians stationed or working abroad (UOCAVA voters). As an officer in the army, Secretary Warner experienced firsthand how difficult it is for soldiers and civilians abroad to vote and return a ballot in time to be counted. The statistics affirm the case: in 2016, the estimated voting participation rate for U.S. citizens living overseas was 6.9% compared to the 72% participation rate for citizens living in the United States. In 2018, West Virginia’s Secretary of State Mac Warner launched the nation’s first mobile voting pilot for UOCAVA voters. For the first time, on their own Apple or Android smartphone, an authenticated registered voter was able to receive, mark and submit a secret ballot of the correct style from virtually anywhere in the world. Every ballot submitted was encrypted and stored on a geographically distributed and redundant network of blockchain servers managed by the two largest cloud infrastructure providers. At the close of polls, every ballot was printed at the county and tabulated on federally certified tabulation equipment. Post-election audits were performed on every ballot submitted via smartphones. Following this small but successful set of pilot elections, Secretary Warner has emerged as a thought leader in America’s elections. In February, he spoke at an event hosted by the Bipartisan Policy Center where he showed this video describing the State’s experience with remote mobile voting. In addition, a white paper has been published sharing the results of the 2018 midterm election pilot. Several misconceptions have surfaced about the West Virginia pilots that we, at Voatz, wish to dispel, along with some good questions that we’d like to answer. Q: What is “blockchain voting”? The phrase “blockchain voting” is a misnomer. As used in the West Virginia pilots, the term “blockchain” refers to a well-vetted method of storing voting transactions immutably across multiple, redundant, geographically distributed servers that makes it virtually impossible to hack. 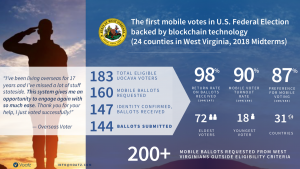 What West Virginia did was remote mobile voting, which leverages the advances in smartphone hardware, biometrics and cryptography in addition to blockchain technology. The combination of these technologies is what makes remote mobile voting a compelling solution. It is therefore important to distinguish — and also name — from “blockchain voting”. Q: What’s the difference between “mobile voting” and “blockchain voting”? This is an important distinction. The term “blockchain voting” refers to a type of voting that uses a blockchain to store vote transactions. “Mobile voting” combines advances in smartphone hardware, biometrics and cryptography to create a compelling solution to the challenges involved in a voting system: the ability to authenticate a voter’s identity, anonymize and secure that voter’s identity, allow a voter receive the correct ballot style, submit it, and verify their vote. In Voatz’s case, blockchain technology is used as a final step to immutably secure the ballots, and to provide the jurisdiction the ability for a robust post-election audit. Q: What value does blockchain technology offer to elections? The blockchain storage method performed two functions in the 2018 pilots. First, it secured the incoming votes from voters in 31 countries from manipulation. Second, it functioned as the secure infrastructure that enabled a transparent post-election audit of a voter-verified ballot. Q: Why is blockchain technology, which is used to secure bitcoin, relevant to elections? The advantage of a “public blockchain”, which is the type used to distribute trust and secure bitcoin, is not relevant in elections because elections are jurisdiction-specific (e.g. a city, a county, a country), and require the ability to ensure that participation in the blockchain happens within the boundaries of that jurisdiction. As such, a “permissioned blockchain”, rather than a public blockchain, is instead relevant for, say, the West Virginia Secretary of State to be able to provide 24 counties with a single infrastructure to store voting transactions, and to ensure that all validating nodes operate within U.S. boundaries. Q: Was the voter’s ballot private? Yes. When the voter submits their ballot, an anonymous voter ID (AVID) is created in the smartphone application that is cryptographically attached to all voting transactions. Only the voter knows the AVID linked to their own identity. Q: Were West Virginia’s county clerks able to perform post-election audits on ballots printed from the blockchain? Every ballot was voter-verified. For a small number of voters who accidentally submitted their ballots before voting on every contest, each voter was able to spoil their ballot and cast another. Since blockchain storage is immutable, spoiling the first ballot does not remove it from the blockchain. Both blockchain-stored ballots had the same anonymous voter ID; only the one with the latest timestamp was printed and tabulated. Progress in elections is slow — many believe that is a good thing. New technology and new methods inevitably go through a series of pilots, and it is through these pilots that we learn, make adjustments, and repeat the process. Each new pilot benefits from the learnings that came before it, and with each new pilot, we continue to build toward progress. Today, Voatz is in a period of very rapid learning and that is exhilarating. We look forward to serving election officials who seek to bring greater security and convenience to their voters, regardless of their circumstances.